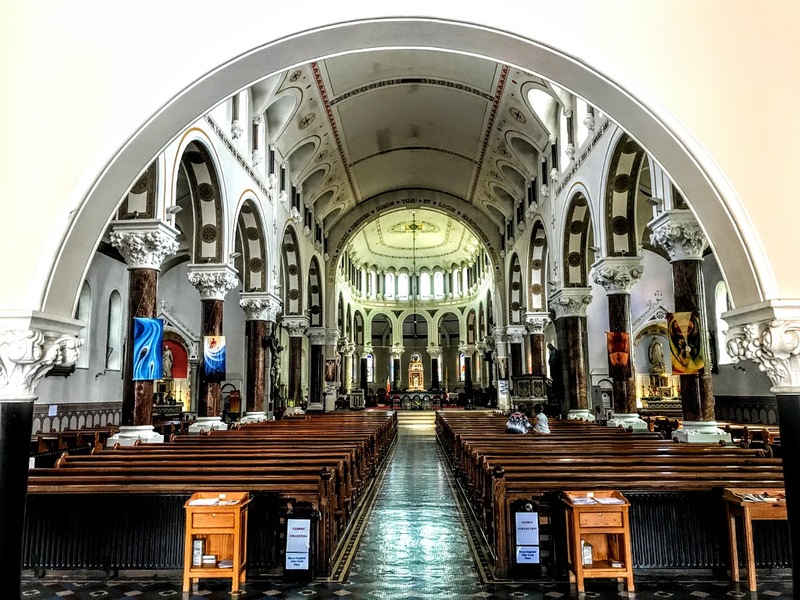 I was in Thurles, Co Tipperary, on Wednesday morning [25 July 2018], and for the first time ever I visited the Cathedral of the Assumption, the cathedral church of the Roman Catholic Archdiocese of Cashel and Emly. In the Church of Ireland, the cathedral on the Rock of Cashel was closed for worship in 1721, and a new Georgian cathedral completed in 1784 was named the Cathedral Church of Saint John the Baptist and Saint Patrick’s Rock. 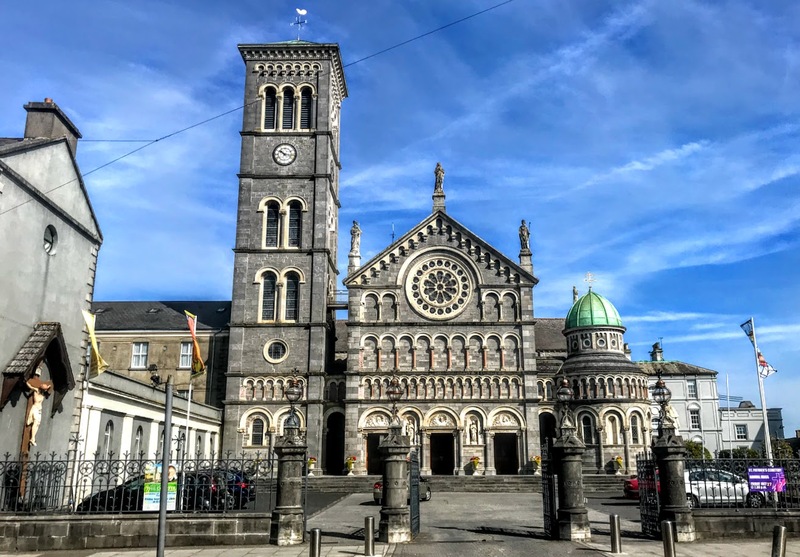 The Cathedral of the Assumption on Cathedral Street in Thurles is striking and unusual for its style and stands on the site of earlier chapels that at one time were the only Roman Catholic churches in Thurles. The cathedral is the fourth church to stand on this site. The first one recorded was a Carmelite church founded by the Butler family in the late 13th or early 14th century. The Carmelite friary was dissolved on 28 March 1540 with the dissolution of the monastic houses at the Reformation, it fell into disrepair and was later demolished. 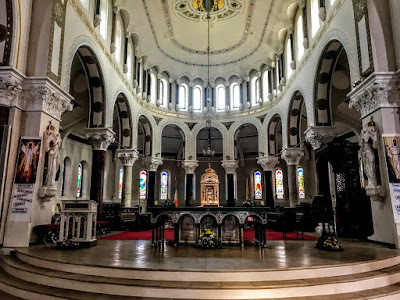 The second church, known as the ‘Old Chapel’ or the ‘Mathew Chapel,’ was built around the 1730 under the patronage of a the Mathew family, cousins of the Dukes of Ormonde. The third church, the ‘Big Chapel’, was dedicated to Saint Patrick, and was a spacious, T-shaped building built in 1807-1808 at a cost of £10,000. The Big Chapel served as the cathedral until the early 1860s. 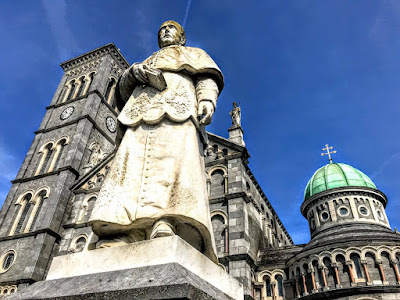 Rome had left the Diocese of Cashel vacant for some years after the death of Archbishop John Brenan before Pope Innocent XII appointed Edward Comerford as the Roman Catholic Archbishop of Cashel on 14 November 1695. 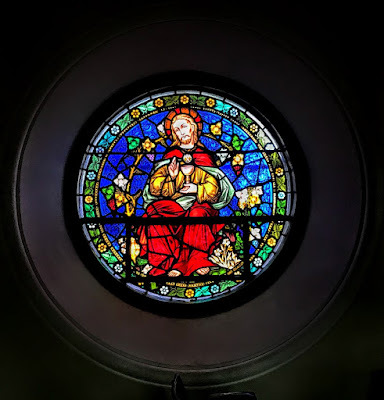 He was also the Administrator of the Dioceses of Kilfenora and Emly, and correspondence indicates he lived in Thurles with the protection of the Matthew family of Annfield and Thurles, and through them enjoyed the patronage of the Butlers of Ormond. The Nenagh county sessions in Co Tipperary heard on 17 July 1704 that Edward Comerford, who was then 60, was then the Parish Priest of Thurles, but there is no mention of his episcopal claims. He continued as parish priest of Thurles under the protection of the Mathew family, living at Annfield, the home of Toby Mathew. Archbishop Comerford died in office on 21 February 1710, and was succeeded as archbishop by Christopher Butler (1711-1757), a member of the Ormonde family, and a native of Westcourt, Callan, Co Kilkenny. While he was archbishop, the Diocese of Emly was incorporated into Cashel by a decree issues by Pope Clement XI in 1718. The Mathew family built a large thatched chapel, known as the ‘Old Chapel’ or ‘Mathew Chapel,’ near the friary ruins in 1730. Archbishop Christopher Butler was succeeded in turn by two other members of the Butler family, James Butler I (1757-1774) and James Butler II (1774-1791). 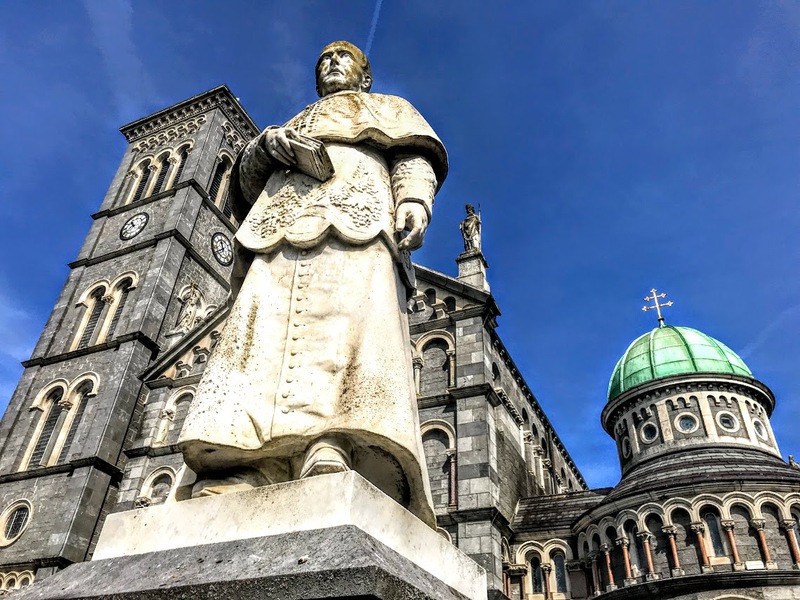 When James Butler II was appointed by the Pope in 1774, he formalised the move of the archbishop’s cathedra and residence from Cashel to Thurles, where his successors continue to have their seat today. His successor, Archbishop Thomas Bray (1792-1820) was never able to realise his vision for ‘a cathedral worthy of the Archdiocese of Cashel and Emly’ but in 1809 he built the ‘Big Chapel’ that replaced the ‘Mathew Cathedral’ and served as a cathedral. 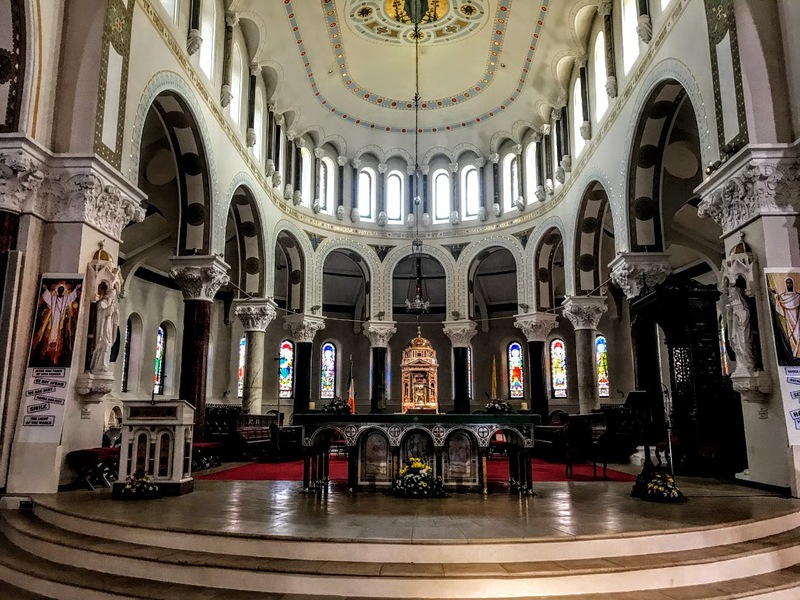 Archbishop Patrick Leahy (1857-1875) was appointed in 1857, and in 1862 he announced his plan to replace the ‘Big Chapel’ in Thurles, which was being used as a parish church, with a new cathedral. 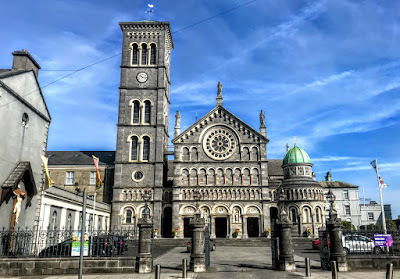 The cathedral stands on the site of the mediaeval Carmelite priory and forms part of a group the other church buildings on Cathedral Street, including the Bishop’s Palace, the former seminary at Saint Patrick’s College, the presbytery and the neighbouring convents. The style of this cathedral is informed by North Italian Romanesque architecture, and both the façade and the Baptistry are modelled on those at the cathedral in Pisa. The exterior was designed by the architect James Joseph McCarthy (1817-1882), who claimed the mantle of AWN Pugin. Archbishop Leahy was an enthusiastic student of Roman history and architecture. McCarthy abandoned his normal preference for the Gothic revival style to accommodate Leahy’s tastes, and designed the building in the Italianate Romanesque style, modelled on the Cathedral in Pisa in Italy, with additional elements of Irish Romanesque and the hybrid Lombardic-Romanesque styles. Work on the cathedral began in 1865 and it was built on a Latin cross plan. The variety of stone and the high-quality masonry in the façade, with its blind arcading, are striking. The cathedral is oriented on a south-north axis rather than the traditional east-west axis found in most churches. The seven-stage bell tower or campanile on the west (liturgical north) side is 38 metres high and is the most important landmark in Thurles. The clock at the top of the tower was a gift of Archbishop Thomas Croke in 1895. 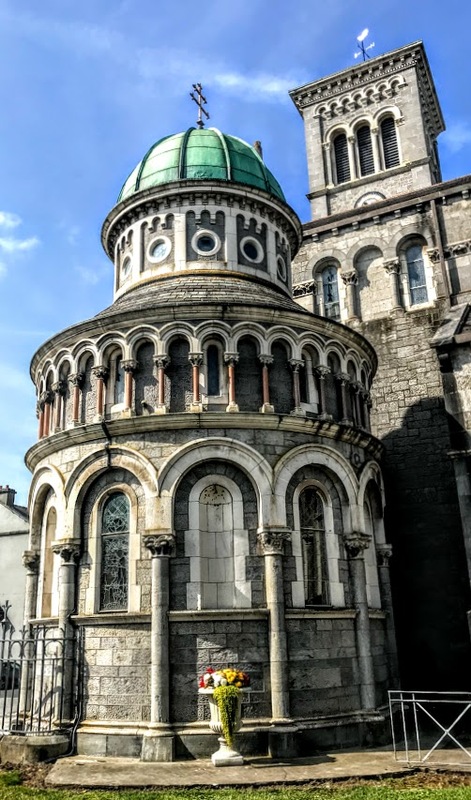 On the east side (liturgical south) of the cathedral, the free-standing round-plan, Byzantine-style Baptistry is an unusual feature in Ireland and resembles the Baptistry in Pisa and at other European cathedrals. The copper roof was added in 1927, and is topped by a gilt archiepiscopal cross. The Baptistry in Pisa was completed in the 14th century, when the top storey and dome were added by Nicola and Giovanni Pisano. This is the largest baptistery in Italy, and is even a few centimetres higher than the Leaning Tower. It is known for its acoustics, and when I visited in 2012 I was treated to a short singing demonstration of this by one of the guards. 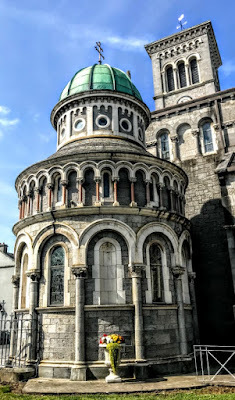 Both the campanile and the Baptistry in Thurles are integrated into the overall composition of the highly-ornate façade. The cathedral has a three-bay gable entrance front and eight-bay aisle elevations, with side aisles and ambulatory. Barry McMullen was the main builder, and the cathedral was built at a cost of £45,000. McCarthy was later replaced as architect by Pugin’s son-in-law, George Coppinger Ashlin (1837-1921), who completed the highly-ornate interior. Inside, the cathedral has the proportions of a basilica, with an aisled nave of four bays, high round arches and a clerestory. 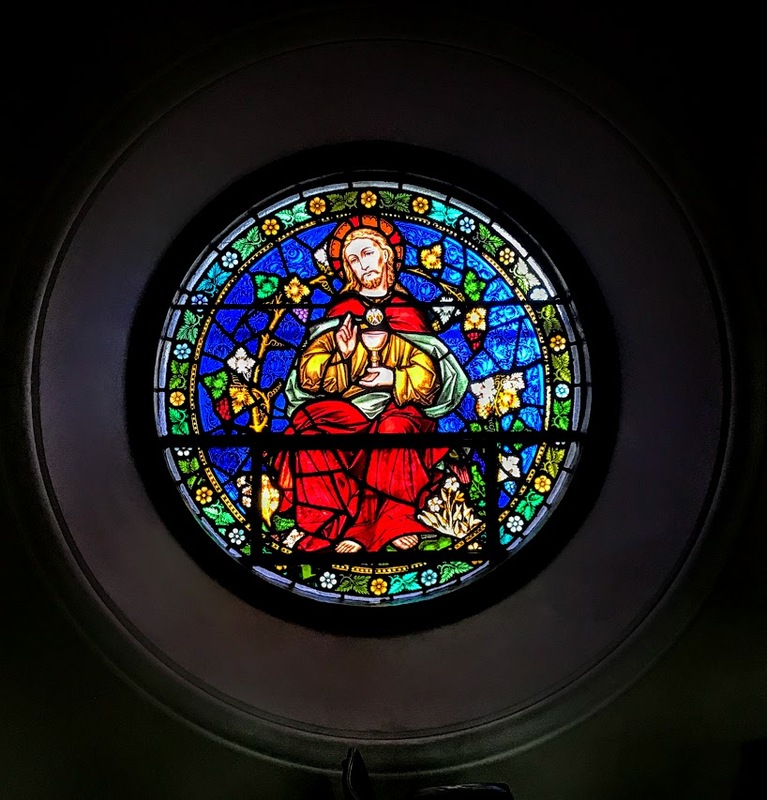 The architectural features in the cathedral include an impressive rose window in the façade, designed by Mayer and Co of Munich. The 16th century marble Italian baroque tabernacle was designed by Giacomo della Porta (1537-1602), a pupil of Michelangelo, for the Church of the Gesù, the leading Jesuit church in Rome. 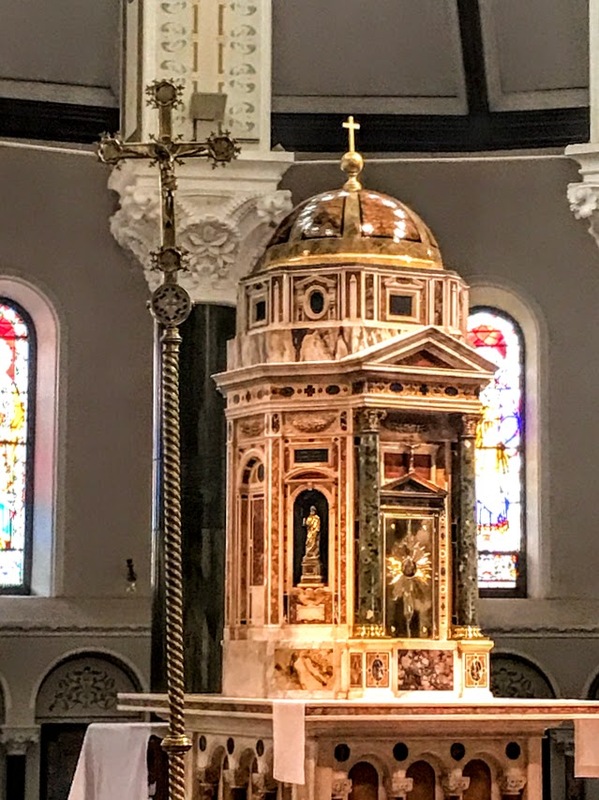 This tabernacle remained in the Gesù in Rome for 300 years, until it was discarded during 19th century renovations. It was bought for Thurles Cathedral by Archbishop Leahy while he was in Rome attending the First Vatican Council. The High Altar was donated by Pope Pius IX. The pulpit, erected in 1878, has carved representations of Christ and the Four Evangelists. The carved limestone piers are topped with lamps and cross finials, and there are cast-iron gates and railings to site boundary. These too are the work of Ashlin. When Archbishop Leahy died on 26 January 1875, he was buried in the uncompleted cathedral. The cathedral was consecrated by his successor, Archbishop Thomas Croke (1875-1902), on 21 June 1879. 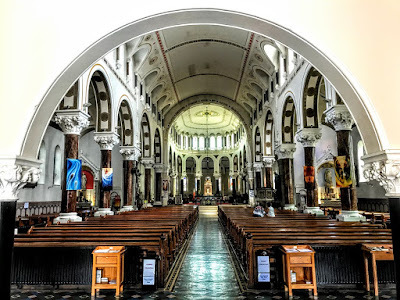 The interior of the cathedral was reordered in 1979 to meet the tastes of the post-Vatican II liturgical reforms and to mark the centenary of the consecration of the cathedral, and the reordered cathedral was reconsecrated on 21 June 1979.